I purchased 1 as a gift and 1 for me because my daughter and I work out in different ways and want to keep our hair together without showing or exhibiting too much stress. I do Zumba, Yoga, treadmill, Bang and recently added Bootcamp. She does Basketball, Flag football, Total gym workout and Boot camp. She told me that this was one of the most practical gifts she has ever received because it is so versatile. She's right. We love the multi-way head wrap. I have not used the product giving it for Christmas gift. Nice color and I believe my granddaughter will love it. Perfect for cleaning, doing errands, and running...all while stylin'! I love that it keeps the hair out of my face during those humid days, as well as has flexibility and versatility. Plus...the designs, colors, and packaging are so unique and fun. Highly recommend! Sun protection for the face and also a reasonably breathable layer to cover the face in the cold. I ordered this wrap a few weeks ago and simply love it! I wear this every morning during my morning walks. It is very humid this time of year where I live and the wrap has kept my hair from getting drenched from the heat and helps to keep my head cool. Can't wait to try all the different looks I can achieve with it. Love the stretchy material and the fact it provides UV protection. Will definitely be ordering more colors! Wear this all the time, for hiking, cycling, gardening. Going through chemo and currently have no hair. The wrap is light weight and cool. Doesn't feel tight on my head, but stays put better than most of my beanies/hats/scarfs etc. This product was exactly what I needed to protect and confine my hair. It's cute and soft. I walk outdoors in all weathers in Michigan, and the wrap is becoming an essential. The different ways to wear it can be tailored to weather conditionsas I walk, so it it always in my jacket pocket. 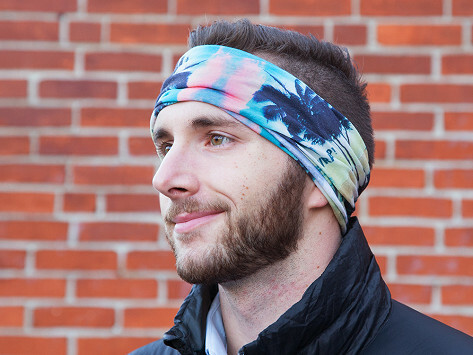 Whether you’re kite-surfing or jogging, this multi-use bandana will keep you cool and comfy. What makes WRAP! unique isn't its eye-catching colors and prints, but also its versatility. Each stretchy, breathable WRAP! can transform up to 10 different ways. It switches easily from a beanie to a scarf—or even a full face mask. Pier Colonnello is the adventurous spirit behind this adaptable head and face covering. As an avid outdoorsman who enjoys snowboarding, rafting, and skiing, he wanted something that would add a dose of warmth without getting in the way. So he chose stretchy material that’s antibacterial, sweat-wicking, and UV-resistant. The result is a multi-functioning layer of protection that keeps your head and face covered as it shields you from the sun, cold, and wind.